Kepong is a place I avoid going to, because parking is often horrendous. It’s a different story when rif is driving, because I don’t have to stress myself going through small roads, alleys and squeezing into small parking spaces. 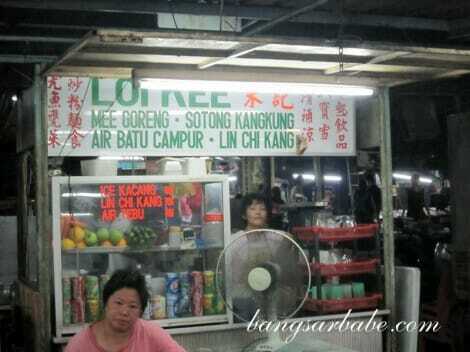 We chanced upon this nasi lemak stall next to the Wai Sek Kai while looking for a parking spot – rif wanted mango loh. Unlike some of the stalls in the food court, there was a long queue at the nasi lemak stall. That was close to 10pm. We decided to skip mango loh and joined the queue for the nasi lemak. I was so worried they would run out of chicken rendang since many people in front of me ordered the nasi lemak ayam. Turns out, I was worried for nothing as I still managed to get a piece of chicken thigh. 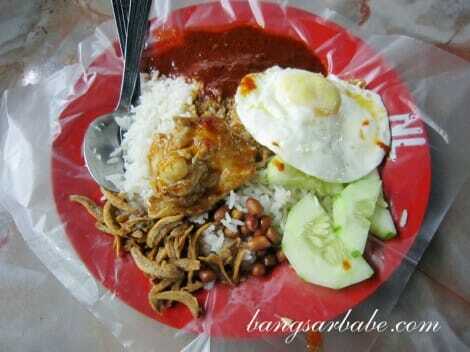 I paid RM4.80 for my nasi lemak with chicken rendang and egg; pretty reasonable by my standards. 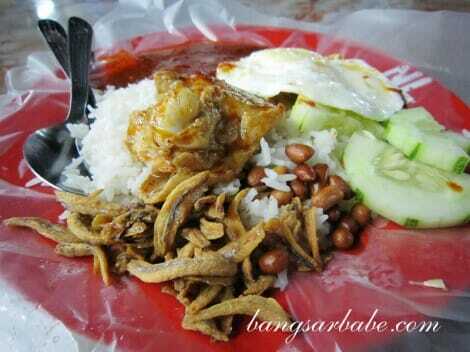 The sambal and rice defines the nasi lemak. To that former beauty queen who tortured me tried to make me lose weight by asking me to hold off the rice and pretend that the egg white was ‘rice’, you might as well not eat nasi lemak at all. A good nasi lemak should come with sambal that packs a punch. 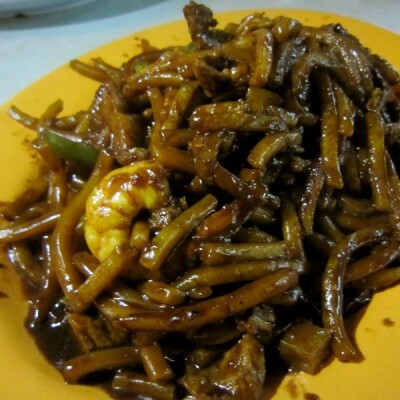 It should be spicy, yet lemak with sweet accents from the caramelized onions. This sambal was almost there. I liked how it was spicy and sweet, but this sambal lacked the rich flavour which the one from Nasi Lemak Warong Sinarnor had. That said, the rice was pretty good. It was fragrant and rich from the coconut milk, and the rice grains were fluffy and well separated. The ikan bilis here was slightly larger than the ones I’m accustomed to. They were fried till crispy perfection, and added a salty kick to the rice. The chicken rendang was decent, but nothing to shout about. Cooked till tender, the chicken was well-flavoured by the rendang gravy but it wasn’t as spicy or fragrant as I had hoped it would be. Still, it went well with the nasi lemak. The nasi lemak stall opens from 7pm onwards, and most items are sold out by 10pm. I also tried the ais kacang from the stall a few doors away from the nasi lemak stall. It was good stuff. For RM2.20, portion was huge and it was the tastiest ais kacang I’ve eaten in Klang Valley. The ice shaving was smooth yet not overly fine, and the combination of jelly cubes, red bean, sweet corn, milk and syrups was of just the balance. If you can ignore the possibility of rats or other pests walking around, do give this a try. Verdict: Pretty good nasi lemak and ais kacang. Portions are generous and prices are friendly on the wallet. Don’t really see many places selling nasi lemak at night, except at mamaks. But Kepong is also a bit far (and foreign) for me. *as long as I’m not the one driving LOL! Sometimes the nasi lemak stall will be closed if you ain’t lucky as my family and I tried visiting it occasionally. It’s been a while since we came there. Yikes. Too bad I couldn’t ask the uncle for his contact number that night. -_- Otherwise, you can call them to check. It is alright. My family can live with that, though. Okie dokie. 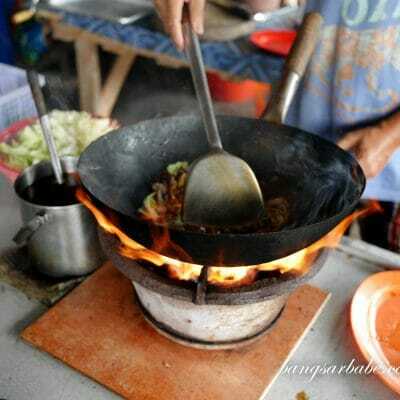 Have you tried their sambal sotong? Wanted to try some but they were sold out. Like I said, it’s been a while since I ate Nasi Lemak there. To be honest, sambal sotong would be my first option naturally and so far it was good. Thanks Bill! Will definitely try the sotong next. Best ais kacang in KL!